Gel liner is by far my favourite form of eyeliner, it's hard not to love it! You can get matte ones, shiny ones, shimmery ones, tons different colours and they last insanely well! The Bobbi Brown gel liner is my ultimate favourite. So when it was time for me to buy another, I found myself reluctant to try something not high end like the Bobbi Brown one. However, since I do not work for the company and no longer have my amazing discount (*sniff sniff), I thought I may as well try a more purse-friendly alternative. Boy am I glad I did! The Maybelline Gel Liner is fantastic. At a fraction of the price of the Bobbi Brown one, it lasts me just as well. I must admit, I do not have particular oily eyelids, so I am not sure how it would compare for someone who does; however, I can't imagine there being a great difference. 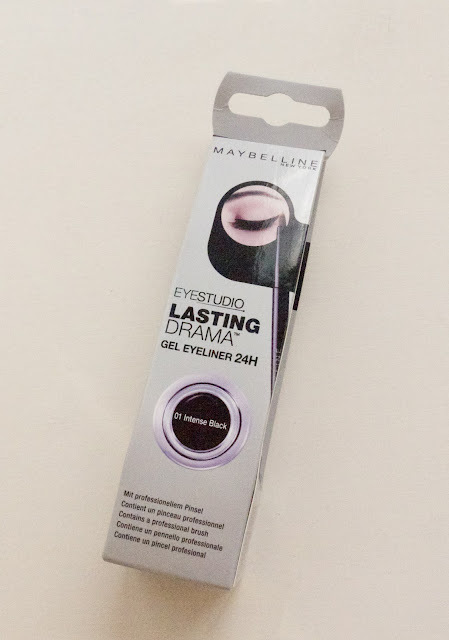 Like the Bobbi Brown liner, the Maybelline Lasting Drama Gel Liner is a very dark black and stays that way throughout the day - even after a swim! Another bonus to this product is that it actually comes with a brush. Although it is not of the same quality as the £21.50 Bobbi Brown Ultra Fine Liner brush, it certainly does the job and does it well considering the dramatic price difference. I am sold.What a great, cost effective alternative!